If 2,000 Tea Party activists descended on Wall Street, you would probably have an equal number of reporters there covering them. Yet 2,000 people did occupy Wall Street last Saturday. They weren't carrying the banner of the Tea Party, the Gadsden flag with its coiled snake and the threat "Don't Tread on Me". 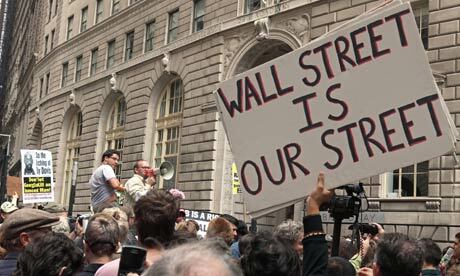 Yet their message was clear: "We are the 99% that will no longer tolerate the greed and corruption of the 1%." They were there, mostly young, protesting the virtually unregulated speculation of Wall Street that caused the global financial meltdown. One of New York's better-known billionaires, Mayor Michael Bloomberg, commented on the protests: "You have a lot of kids graduating college, can't find jobs. That's what happened in Cairo. That's what happened in Madrid. You don't want those kinds of riots here." "On Saturday we held a general assembly, two thousand strong. … By 8pm on Monday we still held the plaza, despite constant police presence. … We are building the world that we want to see, based on human need and sustainability, not corporate greed." Speaking of the Tea Party, Texas Governor Rick Perry has caused a continuous fracas in the Republican presidential debates with his declaration that the US's revered social security system is a "Ponzi scheme" Charles Ponzi was the con artist who swindled thousands in 1920 with a fraudulent promise for high returns on investments. A typical Ponzi scheme involves taking money from investors, then paying them off with money taken from new investors, rather than paying them from actual earnings. Social security is actually solvent, with a trust fund of more than $2.6tn. The real Ponzi scheme threatening the US public is the voracious greed of Wall Street banks. "Debts between the very wealthy or between governments can always be renegotiated and always have been throughout world history. … It's when you have debts owed by the poor to the rich that suddenly debts become a sacred obligation, more important than anything else. The idea of renegotiating them becomes unthinkable." "For the last 30 years, we've seen a political battle being waged by the super-rich against everyone else, and this is the latest move in the shadow dance, which is completely dysfunctional economically and politically. It's the reason why young people have just abandoned any thought of appealing to politicians. We all know what's going to happen. The tax proposals are a sort of mock populist gesture, which everyone knows will be shot down. What will actually probably happen would be more cuts to social services." Outside in the cold Tuesday morning, the demonstrators continued their fourth day of the protest with a march amidst a heavy police presence and the ringing of an opening bell at 9.30am for a "people's exchange", just as the opening bell of the New York Stock Exchange is rung. While the bankers remained secure in their bailed-out banks, outside, the police began arresting protesters. In a just world, with a just economy, we have to wonder: who would be out in the cold? Who would be getting arrested?